What do you get when you combine live rock music, Gourmet Man Food, whiskey, bourbon, and NXT wrestling? Louder Than Life — The perfect recipe for a festival. Day one was dreary, cold, wet, insanely muddy, and Champions Park in Louisville Kentucky was packed. The line to get into the park was wrapped around several times outside the gates while waiting out a two-hour delay. However, festivities quickly picked up speed and wasted no time once the gates were open. From the moment you stepped foot into the park, there were options so you could cater your experience at Louder Than Life, to the one that was perfect for you. Whether you were there for the food, NXT matches, whiskey, the music, or a little bit of everything. For those that were there for the music, there were four stages to choose from for performances. Whoever scheduled the lineup was a genius! There was no overlapping of acts, so you didn’t have to compromise on which ones to watch. You just had to pick the ones you wanted to see, and get to the stage for their sets. Though getting to the stages proved to be tricky. With the early morning rain and amount of traffic walking through, most of Champions Park was a mud pit. You really had to be careful walking around. There were more than a few people that fell and busted something in the particularly bad spots. Even with staff trying to lay mulch for traction, there was only so much that could be done to combat the mud. Many people opted to avoid making trips across the park, because of the mud hazard, and instead camped out at one stage until the headlining Godsmack and Rob Zombie performances. 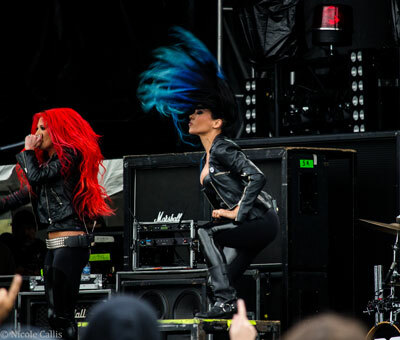 Butcher Babies opened day one on the main stage, and they rocked it. A performance I was not expecting much from, having never heard of them before, but one that ended up being pleasantly surprising. The metal roar coming out of Heidi Shepherd and Carla Harvey was not something I would have ever expected to hear! Their shock-rock style was one of the top acts of day one. 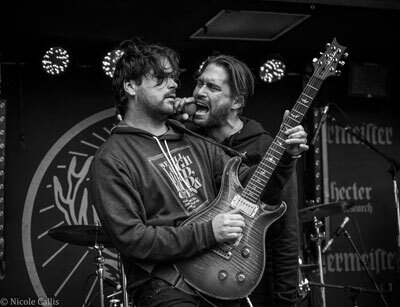 As the day went on, more less known bands played their sets on the Jägermeister stage. Aranda was another band that was a surprise I was not expecting. This four-piece, Oklahoma based band, fronted by brothers Dameon and Gabe Aranda had a hard rock-lite sound with the slightest hint of country twang from the instruments and vocals. You could see how much they love to play music, and how much fun they had with their set. It was another performance that made its way to one of the top ones of the day. Later in the day, you had sets from bands like Atreyu, Chevelle, Hollywood Undead, Sevendust, and others. The park was packed with a turnout of 50,000 people for the second annual Louder Than Life. Sevendust and Seether were some of the last sets before nightfall. As expected, Sevendust commanded a huge crowd with their 40 minute set, with screaming fans that were surely heard within a 2 mile radius of the park. They came on stage rocking, and didn’t stop until their set was over. 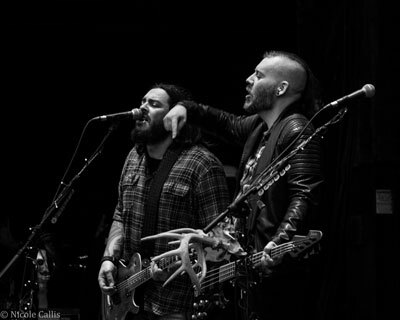 Seether’s 40 minute set was the winner of the day. Hands down. I went into that one pretty apathetic with them as a band in general, but came out completely impressed. They are one of few bands today that actually sound better live. The crowd that was gathered for their set was full of energy, and fans that were singing along, dancing, crowd surfing, women (and men) flashing the cameras, and metal horns raised high and proud. Prior to their set, I was starting to get tired, and finding my energy was waning after already being there for eight hours. After their set, and absorbing some of the energy from the crowd, with a second wave I was ready to finish out day one! Godsmack took stage as a headlining act with a crowd that reached back halfway through the park. A few songs into their set, they brought their videographer on stage and introduced her to the crowd. They let the crowd know that they were recording the show, and that amped up everyone enough to be extra loud and enthusiastic. About halfway through their set, front man Sully Erna took a seat behind a second drum set, and played alongside drummer Shannon Larkin. By the end of their set, you could see Erna, glancing backstage, checking time to see how many songs he had left. When the producer signaled none, he went ahead anyway with “I Stand Alone,” before finishing out their set. No downtime in between, Rob Zombie comes out on the other main stage. Covering tracks spanning his music career, with several from Hellbilly Deluxe. 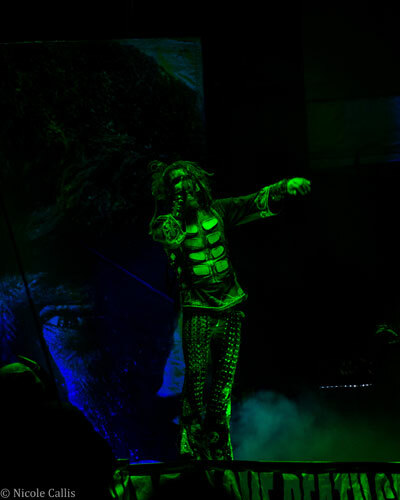 Rob Zombie’s one hour set does not disappoint. In his true eccentric ways, he even slowed it down for a minute to get funky and dance as they performed a rendition of “Brick House.” Rob made sure to shout out to the crowd and show his appreciation for the incredible turnout, and let them know he was just as excited to be there! For day two, I decided to see what else Louder Than Life had to offer, beyond the music, of course. The Bourbon World tent, had a vast selection from brands you would expect to see, like Evan Williams, Jim Bean, Angel’s Envy, and Makers Mark. There were also booths with smaller, local to Kentucky bourbons: Buffalo Trace, Basil Hayden’s, and Town Branch. The atmosphere in the tent resembled an old-timey saloon, equipped with a piano player, racks of whiskey barrels, and cigar smoking patrons. The Gourmet Man Food at Louder Than Life was an experience in and of itself. With dozens of food tents, there was no feasible way to try it all. Not without going broke…or having a Cardiologist on hand. I picked two booths to have something for lunch and something for dinner. Ones that had the most unique options that I would not be able to find back home. Being a seafood junkie in the Midwest, you don’t have many seafood options, so I had to try it. Opting for the traditional roll, I was handed a huge roll that looked amazing — Lobster overflowing the boundaries of the bun. It made my stomach jump for joy and quiver in fear at the over-stuffed feeling it was about to have. To say it was amazing would be an understatement. For dinner, Up In Smoke, looked like a good choice. The food people were walking away with intrigued me because it was not combinations you would see every day. Deciding on one of their Munch Bowl options, I watched on as they piled nacho cheese fries with smoked pulled pork, and topped it off with a mound of macaroni and cheese. With my caloric intake for two days in tow, I found a table and dug in. With too much food to try it all– If the smells that were wafting around the food booths were any indication, then everything was amazing! As if the food, spirits, and music weren’t recipe enough to make an amazing festival, you also had the NXT wrestling. For being the “minor league” of the WWE, these superstars were proof of why NXT wrestling has become wildly popular in the world of sports entertainment, in recent years. The entrance for champion Finn Balor’s match with Tyler Breeze, was awesome! Seriously, YouTube it! It was rumored Triple H might be there, so I kept my eyes peeled, but no such luck on spotting him. Louder Than Life was a festival of epic proportions. Being new to the festival scene, I would not be surprised to see this quickly becoming one of the go-to festivals on a national level! With 2016 being confirmed and planned, I’m excited to see what’s in store.